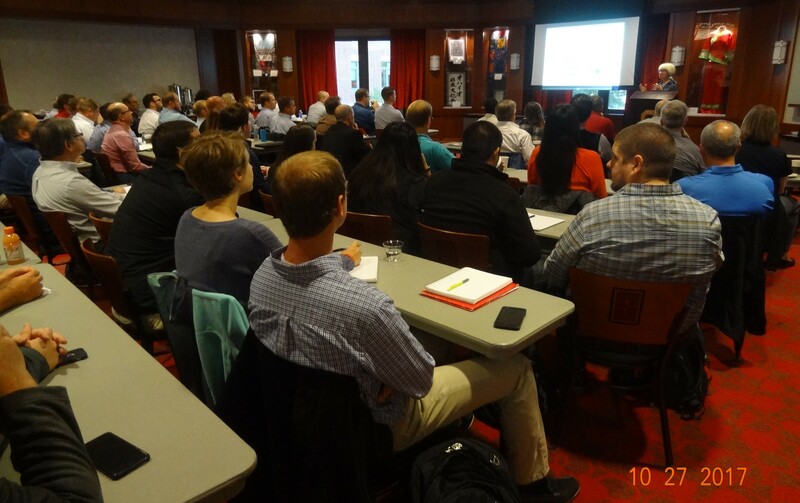 The Fabricated Geomembrane Institute (FGI) presented a short course in Columbus, Ohio on 27 October 2017 at the Ohio State University (OSU) to a sold out, standing room only crowd. The short course was offered in collaboration with the Ohio State University and Owens Corning. The Fabricated Geomembrane Institute (FGI) presented a short course in Columbus, Ohio on 27 October 2017 at the Ohio State University (OSU) to a sold out, standing room only crowd. The short course was organized by the FGI and was offered in collaboration with the Ohio State University and Owens Corning. Figure 1 shows the short course in the beautiful Ohio Staters Traditions Room at the OSU Union in which the short course took place. The excellent and timely presentations focused on the challenges and environmental concerns with containment and engineering technologies and how geosynthetics and geomembranes can be used to mitigate the concerns and risks. The beginning portion of the short course focused on current advances in containment technology for water applications. For example, a presentation by Allison MacKay of the Ohio State University, focused on the importance and scarcity of water resources, while Tim Stark of the University of Illinois at Urbana-Champaign (UIUC), provided insight into the latest advancements in geo-storage designs and materials. Doug Evans, of the Ohio Department of Natural Resources (ODNR) reviewed permitting geosynthetic liner systems for water resource projects. Finally, Boyd Ramsey of Ramsey Consulting gave an informative presentation on geosynthetics in water containment and conveyance, followed by Joe Troxell, of S&ME, describing the large water reservoir containment project in Columbus, Ohio and the liner system design and factory v. field seam strengths. Brian Queen, of the Ohio Environmental Protection Agency (OEPA) provided insight on geomembrane wrinkles and leak location surveys. A presentation by Tim Stark detailed elevated temperatures in containment applications. Finally, Daniel Pradel, of the Ohio State University, reviewed the use of MSE walls backfilled with lightweight cellular. Nick Majerus of Demtech Services and Allen Bullock of Leister Technologies provided geomembrane welding demonstrations throughout the day.